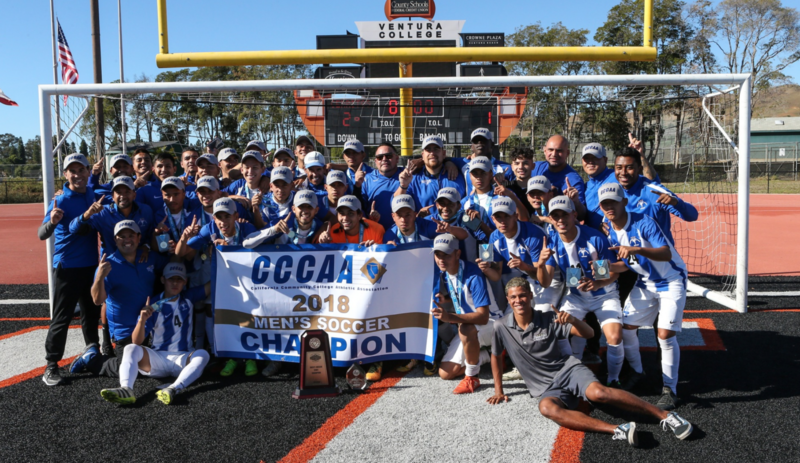 The Cerritos men’s soccer team obtained the California Community College Athletic Association State Championship for the fourth time on Dec. 2, its first title since 2014. The Falcons obtained their five playoff wins against Cuyamaca College (3-0), Oxnard College (1-0), Santa Monica College (3-0), San Francisco City (3-2) and against Golden West (2-1). Cerritos made it to the championship game against Golden West College, it was a tough first period for the Falcons, in the 19th minute midfielder Kevin Everastico scored off a free kick and gave the Rustlers a 1-0 lead. In the second period, Golden West went down to 10 men after Everastico was sent off with a red card. Two minutes later, the Falcons equalized thanks to midfielder Carrillo who was assisted by forward Diaz. In the 86th minute, Golden West midfielder Alex Pinon was also sent off meaning they ended the match with nine men. In the last minute of the game midfielder Gallinar scored a penalty kick to give Cerritos the championship. The Falcons finished the season with an overall record of 21-1-2, after losing the first game of the season the team remained unbeaten the last 24 games to end the season. For the first time in school history, following the state championship win, the men’s soccer team was named the National Champions for Community College Division 3 (non-schoclarship) schools by the United Soccer Coaches according to the Cerritos Falcons Twitter. Cerritos played their first playoff match against Cuyamaca College. The No. 1 seeded Falcons had a tough first half despite having a 2-0 lead. Later Freshman forward No. 9 Kevin Diaz scored in the 35th minute after an assist from freshman forward No. 19 Brandon Pelayo. In the second half, Cerritos added a third goal thanks to freshman forward No. 26 Bryan Villalobos assisted by forward Diaz. Cerritos hosted Oxnard College in the second round. The Condors and Falcons had an intense game with a combination of 33 fouls and 13 shots-on-goal. The game ended scoreless after 90 minutes and went to overtime. Sophomore Midfielder No. 7 Alberto Carrillo scored in the sixth minute of extra time. The Falcons also hosted Santa Monica College in the quarterfinals, this would be the final home game of the 2018 season. The first half ended scoreless, however in the second half Cerritos scored two goals in two minutes, Diaz scored in the final minutes winning the game 3-0. The Falcons would travel for the fifth time to the Final Four, where they took on San Francisco City College in the semifinal. Cerritos had a two goal advantage at the half. In the second half, Ortega scored in the 48th minute midfielder Gallinar with the assist. San Francisco City College was able to intensify the game play by scoring two goals in the second half and almost tying the game in the final minutes. Ultimately the team stamped its berth in the CCCAA state championship matchup against Golden West College, with the 3-2 victory over San Francisco City College. Falcons eliminated from the playoffs with loss to West LA College.